Are you passionate about Textile Art? Here is my new video, from my interview at the Costume Museum, during the ‘Days of Dialogue with the Textile’. 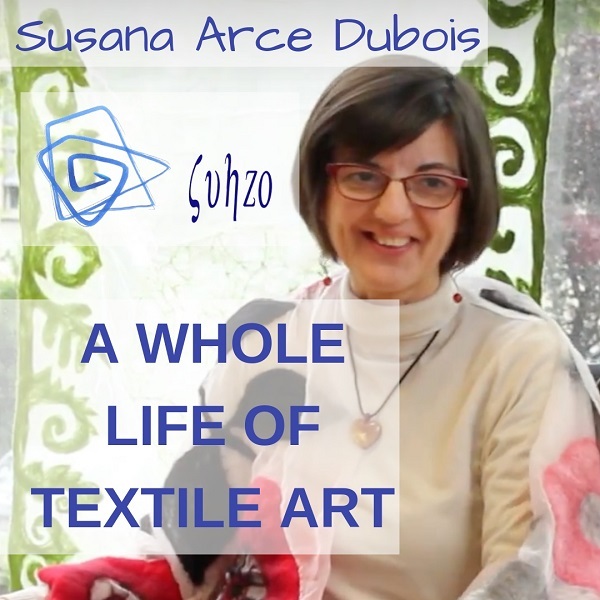 In it, I answer questions about my life as a Textile Artist, give advice to other artists who are starting, talk about my favourite silk painting and nuno felting techniques, and explain how I have made some of the pieces you see in the video. I also talk about what inspires me, what I want to convey with my work, how and where to sell textile art and the value I place on each of my pieces. My passion for textile art and my decision to dedicate myself fully to it have led me to become VicePresident of the Association of Textile Creators of Madrid, to exhibit projects in the Costume Museum, in Textileando, TextilMad and other exhibitions, to give many talks and demonstration workshops, and to collaborate with other prestigious designers and artists. In my workshop in Madrid, I create exclusive fabrics, accessories, fashion garments, interior decoration items and artistic works, I see my clients and I teach specialised courses. If you don’t speak Spanish, switch on the English subtitles on the video. Below, I leave you a summary of some of the questions I was asked and my replies to them. How did you come across the textile world? I have been passionate about textiles all my life. I used to love seeing my grandmother knit or do crochet when I was little, and I learnt to knit when I was six or seven years old. I have always been drawn to fabrics, to sewing… I have always made many things with my hands. While I was in university, I loved to get fabrics and I made my own clothes, I experimented with my siblings, and made them costumes for Halloween and other occasions. There has not been an exact moment in which I said: ‘I love textiles’. I think it’s been a passion of mine during my whole life. I did a degree in Biology, because of family circumstances, but I have always felt the need to create. For many years I did courses and attended textile art classed and I created in my free time while I was studying and later on working. If you had not been a textile designer, what would you have liked to do? I think I would have worked in something related to Biology, but I could not be somebody different from who I am, and I believe that, in the end, life leads you to develop who you really are, and not what the circumstances dictate. Do you remember your first textile piece? My first large piece was a batik; a batik on cotton. It was a picture of some horses. I think I must have been 17 years old. When did you start working seriously as a textile artist? I started doing textile art more seriously when I came across the Association of Textile Creators of Madrid. The Association made me realise that there are very professional people in the textile world, and it made me think about following that path too. I finally took the decision to leave a permanent job to dedicate myself completely to the textile world, to my vocation, because for the past few years I was finding it very difficult to go to my workshop and create after working eight to ten hours a day in an office. It was a very carefully considered but very satisfactory decision. The path is not a bed of roses, but I think it was the right decision. Yes. My Brand is called Suhzo. It means… It’s more or less how ‘silk’ sounds when it’s pronounced in Chinese, but it’s written in our alphabet and with a ‘h’. Years ago, I started doing craft fairs in England and I had to have a trade name, so I decided on Suhzo. And I like it, because ‘Su’ sounds like Susana, and Suhzo means silk. I like the name. If your works could talk, what would they say? What I try to convey with all my pieces -whether it is a scarf or another accessory, a fashion garment, an interior decoration item, a fabric for a wedding dress or a party dress, or a purely artistic piece- is ‘Beauty’, ‘Beauty’ with a capital ‘B’. It is very important for me that the people who own one of my pieces feel that they own or that they are wearing something ‘Beautiful’, unique, special, that brings out their own ‘Beauty’. In the case of my scarves, many people say to me: ‘Your scarves are so beautiful that they nearly look like paintings. When you wear them around your neck, folded, the design disappears.’ And my reply is always the same: ‘Yes, but you know what you are wearing, and that’s what’s important for me, that you know you are wearing something special, something ‘Beautiful’. And I was in Japan last summer and, since I came back, the Japanese influence is very noticeable in all my work, in how I use colour and in my designs. Are there other textile artists that inspire you, that you really like? I like the work of Kima Guitart very much. I discovered her in a catalogue when I was in university, and I really like her work. I also like the work of Liz Clay very much. She is a textile artist that works with felt, with nuno felt. I have done two intensive residential courses with her in England. And I have just discovered a Japanese artist called Atsuko Sasaki that does amazing work in felt. Where do you usually work? Do you have a Workshop? Yes, I have a workshop. Before, I used to work at home, at my mother’s, but it was very complicated because we are a large family and many of my siblings live far away. Every time somebody came to visit, I had to put everything away. Then, when I went to live on my own… I live in a small apartment, and I don’t really have room to have a two metre by one metre frame. A few years ago, I rented a workshop. It was very small, but it was an exclusive space for my textile work, and I managed very well there. I now have a larger workshop, which I love. I have a dedicated space to create and work, and I also have room to teach clases and workshops. And, on the upper floor, I can meet my clients, show some of my work and do pop-ups. Which support do your work on? As I mentioned before, I started doing batik on cotton. Then I discovered silk, and I fell in love with silk. In fact, I’m still in love with silk. Today, silk -the different types of silk– is my favourite support, or should I say my only support. When I paint and I’m in front of a completely blank fabric, for me it is a process of dialogue with that silk. The fabric directs the process, beyond the design I may have in my head, and that fascinates me. It makes me go into a bubble when I’m in my workshop, where time and space disappear. I have not found any other support that gives as much to me as silk. I do a lot of batik on silk. I use all the silk painting techniques, but I nearly always end up adding some wax, some batik, because I can’t achieve the transparencies that I get with wax with any other silk painting technique. I also do nuno felt. I started to do nuno felting because there was a moment in which I wanted to add texture to my works -but not with embroidery- and then I discovered nuno felt. But even when I do nuno felt, many times I mix it with batik, with paint. Batik is a technique in which you ‘reserve’ areas of the fabric with hot wax mixed with more or less paraffin depending on what you want to achieve, and then you apply colour. The area which has wax absorbs more or less colour depending on the amount of paraffin it has. It is true that the difficulty of hot wax is that you then have to remove it and that the fabric is kind of stiff even after you take off the wax, and you have to try a thousand ways to make it soft again, but I can’t achieve the same transparencies with cold wax as with hot wax. And I get much more out of the brushstrokes with hot wax than with cold wax. That’s why I like to work with hot wax. I think they are different techniques. Nuno felt is made by ‘pushing’ the fibres of the wool through the silk with water, soap and pressure… through the silk or through any other fabric. Nuno means fabric in Japanese. I work on silk. You draw by placing the wool, and then you felt it little by little. You can also add pieces of other fabrics, which you hold in place with the felt. When you make felt, you always have to take into account the fact that felt shrinks. You can draw a perfectly straight line with the wool on the silk, but as you felt it, it shrinks and wrinkles… which sometimes is beautiful, but sometimes you want it to stay straight. There comes the experience, the technique, knowing how much pressure to apply, when you have to stretch it again, when you have to reposition it. A nuno felt piece can involve many hours of work, but you can’t achieve the same texture and effect any other way. For years I did a lot of craft fairs, mostly in England. I have also done pop-ups here. And then, through my website and promoting it on Facebook, Instagram, YouTube, Twitter, by email… Nowadays you have to use online platforms. How do you value each of your pieces? There are pieces that are like your ‘favourite children’ and when you sell them, you feel kind of sad, but it’s not the same to sell a piece to somebody that you know is going to take care of it, than when you sell it in a fair to somebody you don’t know and you have to let go of it completely. And there are some pieces that have more of you than others. There are commissions that are more… For example, I don’t like repeating designs, but sometimes I have to do it. Even though you tell the client: ‘Even if it’s the same design, the result will never be the same, never!, because that is not possible on silk, because each piece will always be exclusive and unique.’ But, many times, you have to repeat a design because it’s very successful. I end up getting bored of it, but sometimes it makes commercial sense, and you have to do what you have to do. What would be your advice to somebody who is starting in the textile world? That they have to really want it. That’s it. In Creativa this year, during a workshop I taught, one of the guys attending asked me: ‘What would you advise me so that I can do this full time?’ And I said to him: ‘You have to really want it’ I think that’s what matters. Where there’s a will there’s a way. That’s the truth. It may not be easy, you have to take care of a lot of stuff that is really boring, it may take you ten years, you may never be rich… But what really matters is that, if that is your passion, it is your passion. Life is too short to spend it doing something that is not going to make you happy. Right? That’s what’s important. It is also very important to train, to continue to train, because, if you don’t know the techniques, it will be very difficult to do good work. You can experiment on your own and it is true that nowadays there are tutorials on Internet on nearly everything, but it is also true that the tutorials are only useful if you have the previous basic knowledge, so that you can understand what they are doing in the tutorial. So, I think it is really important to keep training with high-level people. How do you see the future of textile crafts? Are new things being done? I also think the educational work many of our colleagues in the Association do is very important. Craft Days and craft fairs are also important, so that textile crafts are not lost. Have you found difficulties along the way? What I have noticedis that in Spain textile design, textile art, is not valued enough. Sometimes somebody picks up a scarf and says: ‘My aunty also paints on silk and she can do this too’. Well -maybe- but I have spent two full days in my workshop, working eight to ten hours each day to create that scarf, and it has something from me that no other piece has. So, I think that it is very important to make people understand that unique, exclusive pieces have a cost because they take a lot of work and creativity. If a painting in a gallery can be sold for three thousand euros, why can’t a textile piece be sold for three thousand euros? Because it’s a craft? No. That is the greatest difficulty we have as textile artists. Subscribe to my email list, so that I can keep you informed about my activities, courses, workshops and projects. Subscribe to my YouTube cannel and click on the bell to receive notifications when I publish other videos about my work, exhibitions in which I take place, chats, silk painting and nuno felt workshops.